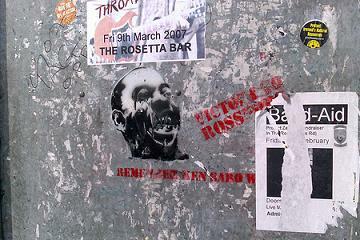 I first heard Ken Saro Wiwa’s name and learned who he was on September 10, 2001. I was listening to the radio as I was driving home from work. When I parked in front of my apartment building, I couldn’t get out of the car. The host was describing Saro Wiwa, a writer and an intellectual who had devoted his life to activism when oil giant Royal Dutch Shell began impinging upon environmental and human rights in Nigeria’s Ogoniland. His vision was to engage RDS through a peaceful, non-violent movement. That movement attracted enough support and international attention to make RDS and the Nigerian government uncomfortable. In 1995, after having been arrested with eight other activists on unfounded allegations of murder, Saro Wiwa was brought to trial and sentenced to death by hanging. As if the execution was not enough, Saro Wiwa’s body was burned with acid and dumped in an unmarked grave. No individual or group ever took responsibility for the torture and execution of Saro Wiwa and the other activists, as well as the exile of Wiwa family members that occurred after the murder. Royal Dutch Shell, of course, carried on with business as usual. The story of Saro Wiwa’s life and death was compelling, and I made a note to stop by the library the following day so I could read some of his work and learn more about him. And then, September 11 happened. I thought about that broadcast this weekend, when I attended PEN World Voices Festival’s panel discussion between Ken Saro Wiwa’s son, the journalist and government adviser Ken Wiwa, and the American novelist Richard North Patterson, whose most recent novel is based loosely on Saro Wiwa’s life and death. The two men convened, along with moderator Okey Ndibe, a Nigerian novelist, to talk about Saro Wiwa’s legacy. Ndibe started the conversation by sharing his own recollections of Saro Wiwa. 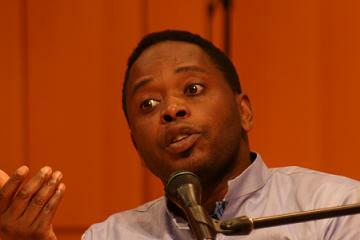 He was “ebullient” Ndibe said of Saro Wiwa, and he “always carried a book” and his signature smoking pipe. Ndibe recalled a man full of life and passion, even in the midst of struggle. Wiwa acknowledged Ndibe’s vision of Saro Wiwa, but added that he believed his father also carried a weight of sadness, which came from the sense that he hadn’t achieved enough in the struggle, or that the efforts of the movement were not making progress quickly enough. Over the course of the conversation, the three men agreed that the ambitious agenda of social, environmental, and economic justice advocated by Saro Wiwa was, if seemingly solitary for Saro Wiwa himself, also profoundly visionary. Today, climate change, desertification, land rights, and the effects of corporatocracies on communities might well be considered the core issues of our time. Saro Wiwa was largely responsible for putting them on the world’s radar screen. I have no doubt at all about the ultimate success of my cause, no matter the trials and tribulations which I and those who believe with me may encounter on our journey. The legacy Saro Wiwa left for us all, agreed Ndibe, Wiwa, and Patterson, was to always keep trying, to stay true to one’s ideals and goals even when no progress or support seems imminent, to stay engaged in the struggle. It’s a message that’s a meaningful reminder for anyone engaged in social justice work, and one that had particular resonance on the day of the panel discussion. After more than 12 years, the Center for Constitutional Rights recently announced that Wiwa v. Shell will open in a federal court in Manhattan on May 26, 2009. After jury selection, the trial is expected to take 4 to 6 weeks. To stay current with developments in the case, visit the CCR’s Wiwa v. Shell website.